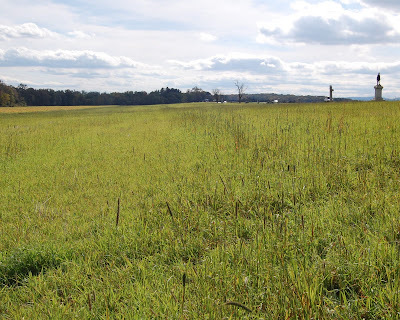 Next month will mark the one year anniversary since I first began posting my findings regarding the most elusive of photographs taken at Gettysburg. 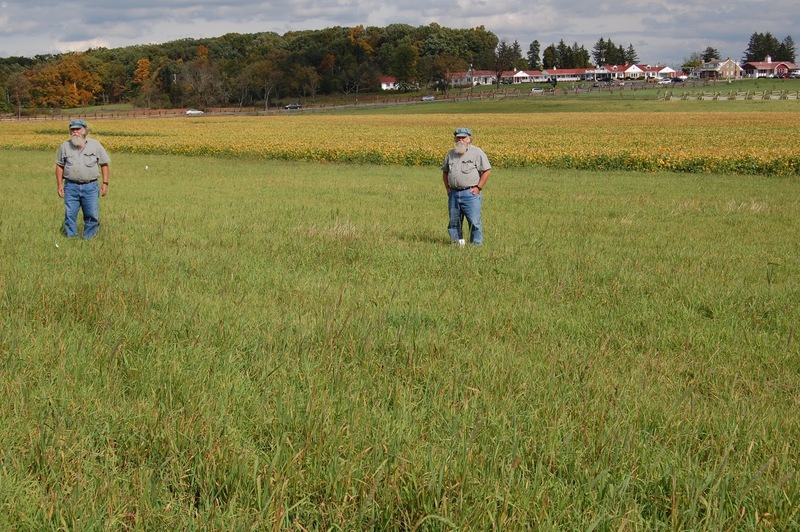 In May of 2011, Scott Hartwig, the supervisory historian with the Gettysburg National Military Park, first brought public attention to this location on the Park's Blog. Personally, I was impressed with his presentation and in-depth research. Scott focused on one of two images looking north east, the "Gibson" stereo view. Curious, I looked at the somewhat broader view taken by Timothy O'Sullivan, and immediately made note that it revealed, in the upper right corner, the Thompson House, known also more famously as "Lee's Headquarters." That November, I took a trip to Gettysburg for the Remembrance Day Commemoration, and set aside some time to visit Scott's site and provide additional support by photographing a modern view that included the house. I quickly saw that Scott's camera location was simply too far away to be precise to the 1863 images, however, he was certainly looking at the correct overall features. 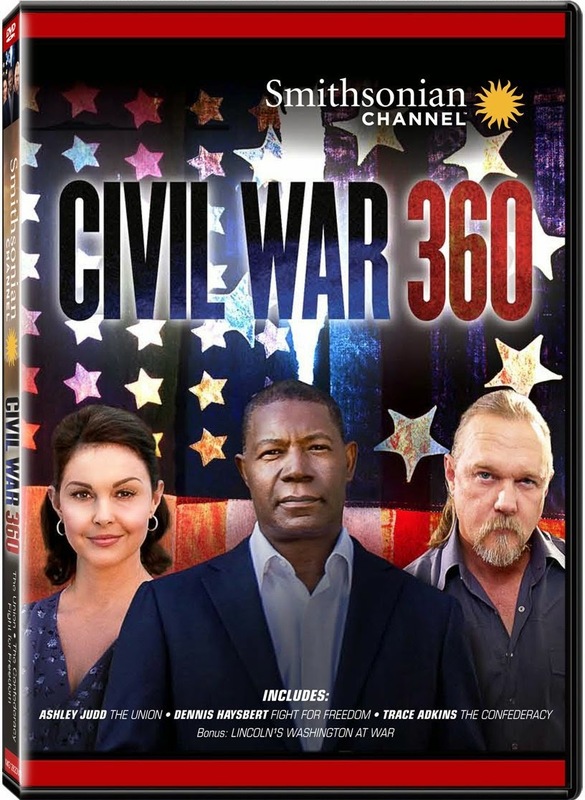 Unbeknownst to me at the time, Garry Adelman had challenged Scott's findings that had been published in the October 2011 issue of Civil War Times Magazine. Adelman's challenge appeared as a letter to the editor in the same magazine's December issue, and declared the location "unsolved" and still open for discovery. "GARRY ADELMAN’S PLEA FOR PATIENCE WITH ALL THINGS HARVEST OF DEATH". 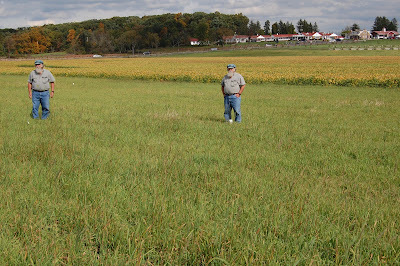 This began my debate with Garry that eventually inspired his creating a thirteen episode presentation on the Gettysburg Daily Blog, wherein Garry and his associate Tim Smith took to task numerous people's theories as to the now notorious "Harvest of Death" location. The series wrapped up with several installments devoted to refuting Mr. Hartwig's and my examinations. 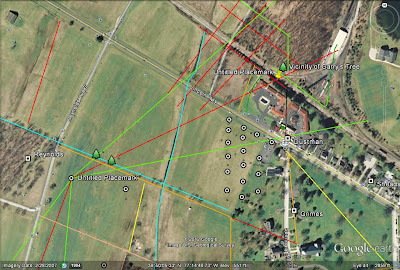 I continued my research, looking further into details the images held, and all the while, with admitted misturns along the way, I made continued posts to this blog site, adding details that added up to supporting the location as the actual site. My one problem though continued to be the distance that I live from Gettysburg, requiring at least six hours of travel time in a day for each visit and no luxury of affording overnight accommodations. Thus I would bring my work home each time and see how the day's efforts fit. Gradually, over several return visits, I made my way along the landscape and arrived at the location that brought all the pieces together, although it is approximately 123 yards west of my initial, heavy concentration of study. 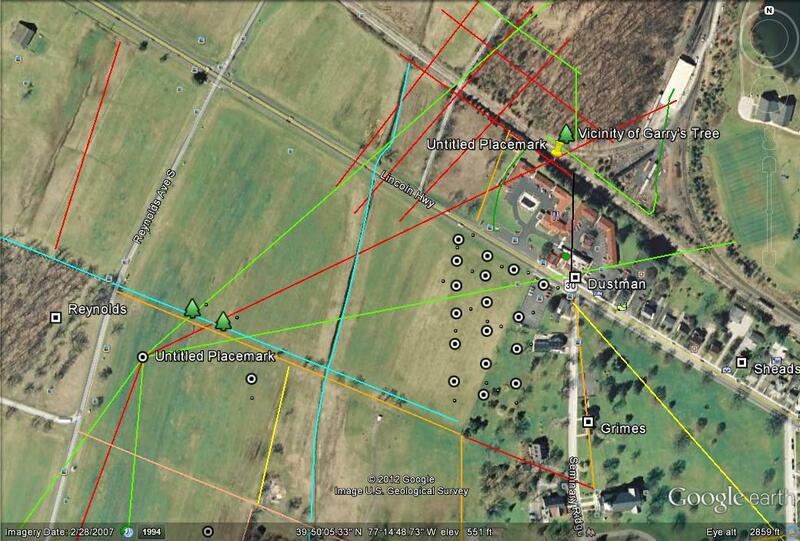 It is also, as I had detected, nearly 190 yards closer to the Chambersburg Road than Scott Hartwig's estimation. However, this is what it takes to fine tune something that has been plagued from the outset by 1863 images that are far from sharp in detail, but still full of revealing information. Thus I present what will rest as the final, and correct, installment of my blog posting regarding these photographs. The challenge of having to adjust by a foot or yard, left or right, up or down or tilted, and in any direction is unnecessary and unwelcome, as this posting presents the final clue that makes this the true location, on the battlefield of July 1, 1863, and provides the source of Alexander Gardner's inclusion of General John Reynolds in the title, "Field Where General Reynolds Fell". 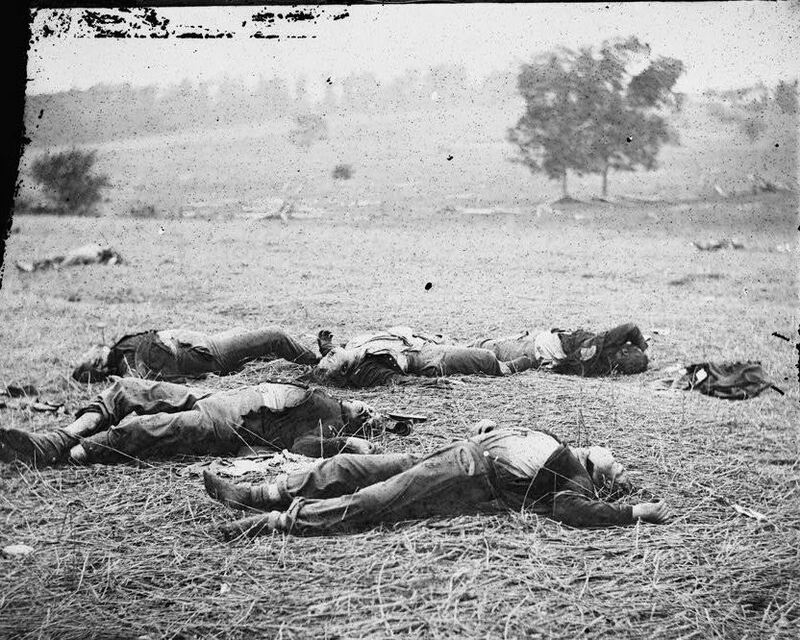 The monument to this incident stands at a short 100 yards or so to the west of where these bodies had fallen. to the full plate version that appears in the 1866, Photographic Sketch Book of the War. is at upper right. 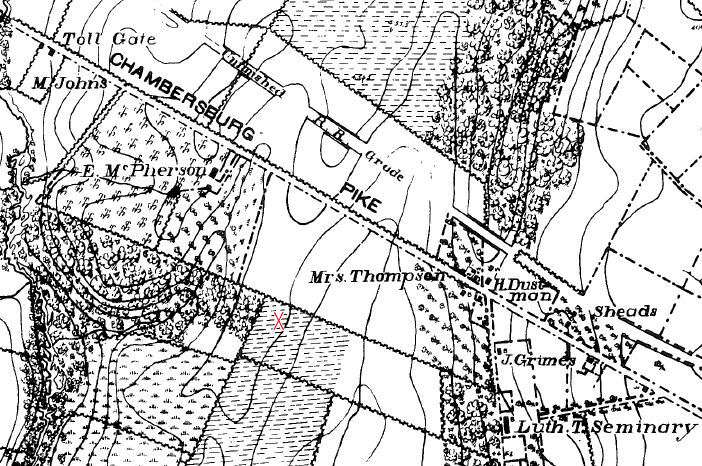 The Chambersburg Pike runs, barely perceptible, along the center of the rise. The approximate same view today, looking roughly 64 degrees North East. 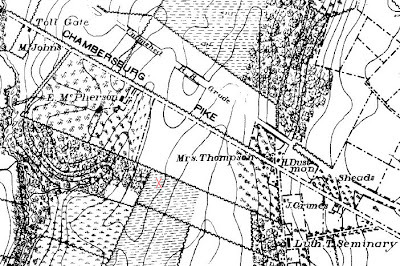 Note the clearer line of the Chambersburg Road and the Thompson House. a motel, blunting the visible edge of the 1863 views. north east direction of O'Sullivan's photograph are annotated. One side of Gibson's stereo view with the Union burial crew. terrain beyond drops and rises toward the horizon line and woods. duplicated figure at center does demonstrate the "sliding scale"
effect against the dropping and rising background, toward the rail cut today. corner and turning nearly due south at the right edge of this detail. A further enlargement in gray scale, with annotations of the space. feet inside that gap, creating the space we see above as a lighter gray band. This feature can not be found elsewhere on the battlefield. Looking roughly 121 degrees south east from the rail cut crossover. Note the gradual rise of the ridge to the left of the rail cut. the Thompson house site, aka Lee's Headquarters. from the opposite side, and a 135 degree, clockwise turn to the south. The approximate same view today, looking roughly 200 degrees South West. For questions regarding the horizon line, see this previous post on the subject. 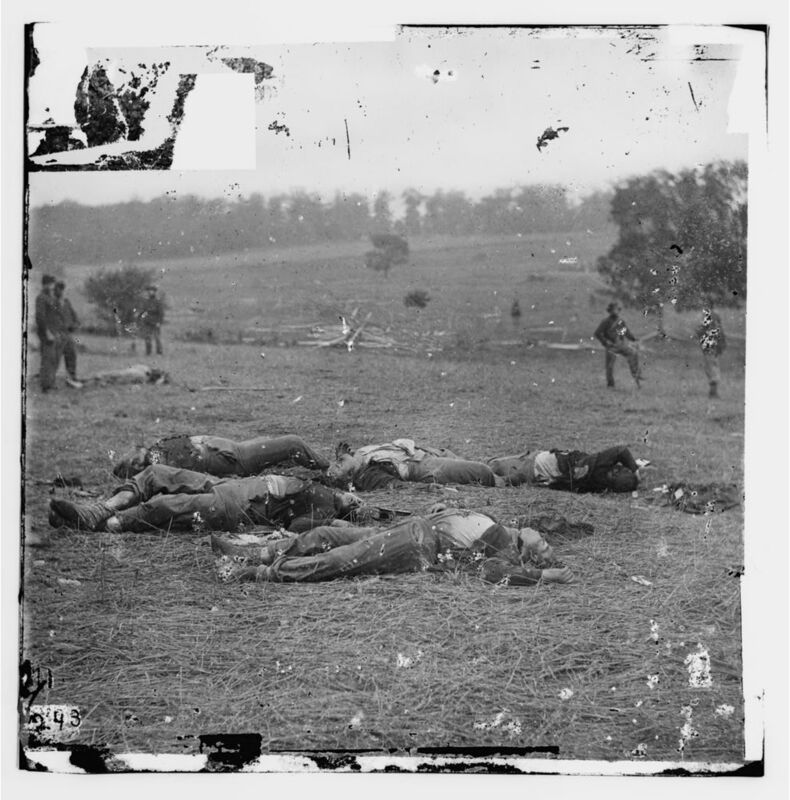 X on the approximate location of the bodies for both 1863 images. My thanks go out to my friend James Anderson for his assistance during my investigative trips. Excellent article and post, John. Despite this location being downplayed by some experts on the subject, I have no doubt that the dead in this view are indeed those of the First Corps and the photos were taken in the field located by Scott and you. Thanks for posting your findings! The choir is singing along with you. Eventually, others with pick-up the tune. Even an untrained eye can see that John is spot on correct. I hope that any naysayers out there will see the accuracy of this work. As this work will be a real benefit to us now and generations to come. Thanks for all the hard work and uncovering the truth. john, i think it's a mistake to correct your old posts. seeing the original trail of evidence, analysis and correction is fascinating. Thank you for your comment. I decided to correct the posts so as not to leave misleading information out there. The important thing in this format is having the location identified. Great detective work, and I agree with others that you seem to have identified the area the photograpsh were taken. There does seem to be a cetain circle of "experts" who want to be right rather than get to the botom of the mystery. Keep the great posts comng. 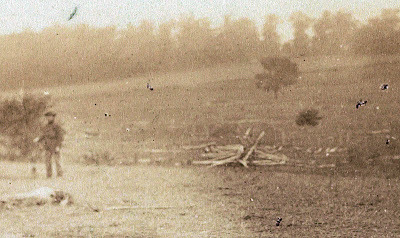 One of the features in the photo you believe is looking towards the Thompson House is the pair of trees in the middle background. Interestingly, a similar pair of trees is depicted in Rothermel's painting "The Death of Reynolds" in approximately the same place. http://explorepahistory.com/displayimage.php?imgId=1-2-1FA (I believe the link has the painting in reverse). I wonder if Rothermel's field sketches are still in existence? John, I have read your article with great detail and have to say you have definitely put in your research. I live about 30 minutes from Gettysburg and travel there numerous times a month. I have taken several photographs myself and also have ideas I would like to pick your brain with. is there any email I could reach you at that would make it easier to communicate? There is an email address in the top right hand column of the blog. Very nice work. With the evidence you provided, I believe you have found ths spot (within a few feet in this or that direction). I attended Civil War Institute last summer and in a not so pleasant tone was informed by the presenter of Civil War photography that this site will never be found. He disagreed with Hartwig's conclusions and would not reveal where he thought the image was taken. My question, I felt was brushed aside and this particular individual made me feel like how dare I question is expertise. My question, since we all know whom I am referring to, have either one of them contacted you recently in regards to your final conclusions? What are their thoughts? I find it strange that there has not been a final rebuttal. You present very strong evidence that will be very difficult if not impossible to refute. From strictly a scientific way of thinking, your thought process leading to your conclusions is very sound. As other above me have stated, I have no doubt that the dead in this image are those of the 1st Corps in the field that Scott Hartwig located. Overall, I say what a tremendous job you have done researching this particular subject. 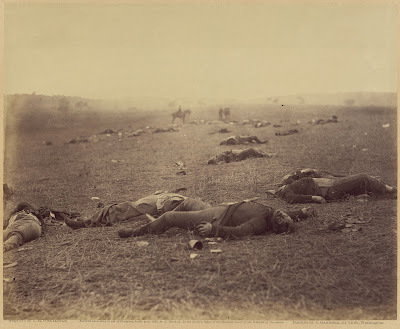 Though you may never get official credit to your find, I believe you have done the Civil War community great credit. 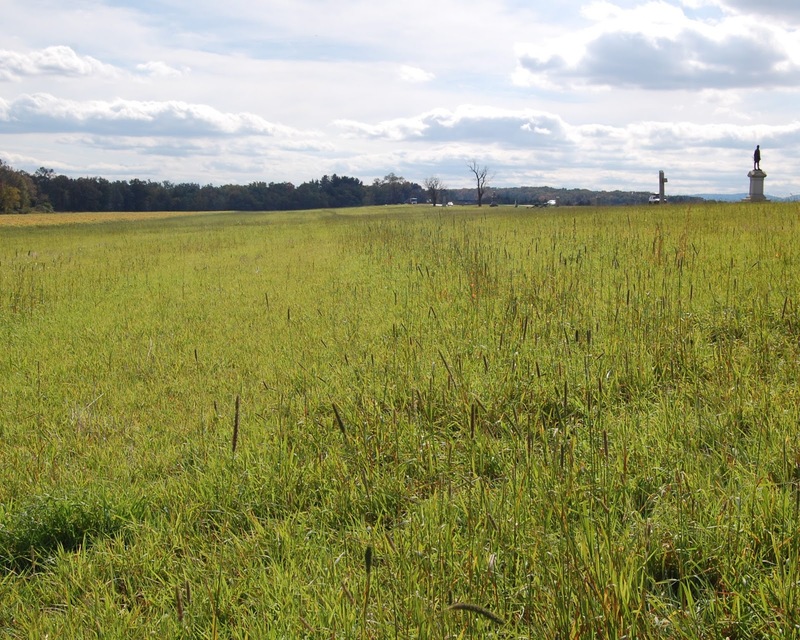 Spotsylvania Battle Landmark, GONE! Harris Farm House Destroyed! Click to order direct from publisher's link. A wonderful documentary I am proud to have been a part of. Click for ordering and more information. Another video production I am proud to have been a part of. Click here for ordering and more information. 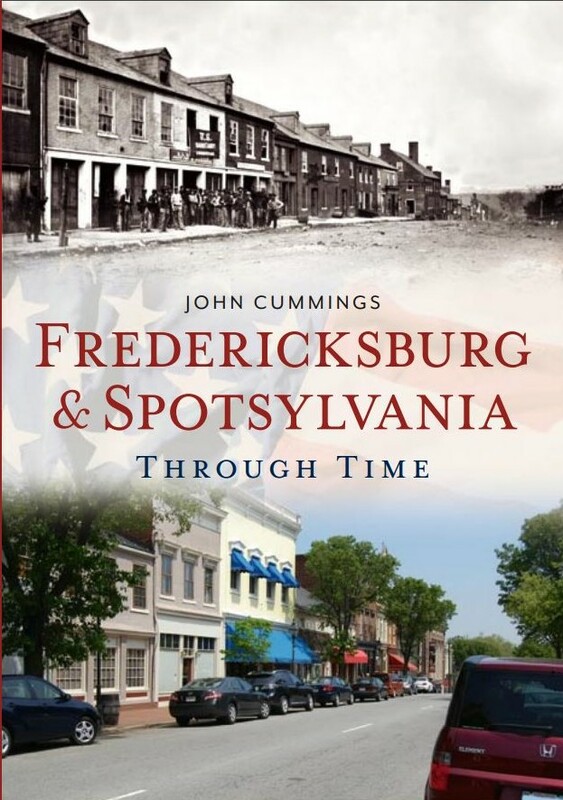 I am the owner of Spotsylvania Commemorative. I conduct historical research and provide battlefield guide services. Living on the Spotsylvania battlefield has its advantages. The most important to me is that I am right on the ground that played an important but usually disregarded role in the campaign. The actions of May 14, 1864 resulted in the near capture of General George Gordon Meade while it also helped to anchor a new Federal left wing. Known as the battle of Myer's Hill, it focused on what was until recently a wooded summit, one half mile southeast from my driveway. 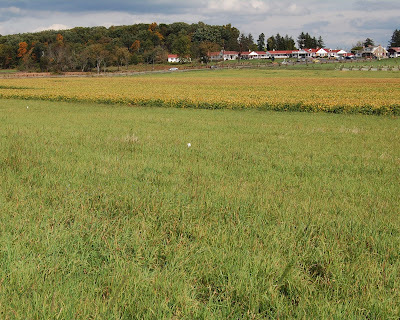 There remains close to 75 acres of land which includes the Myer house site. In 1864 it was a 400 acre farm. I have been trying for more than ten years to influence the preservation of this property. 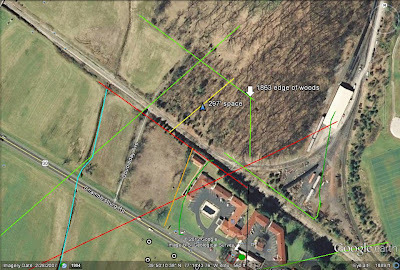 A few years ago some of the cultural resources on the site were damaged during deforesting, including what was a beautifully preserved trenchline built by the Federal 6th Corps. Seeing an imminent threat to the house site, I personally negotiated with the logging company and minimized the damage, while the surrounding acres were clear cut. I have come to know the story of John Henry Myer and his family and the struggle for the farm site they called home. 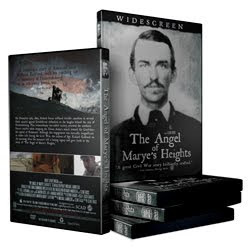 Myer, conscripted into the 40th VA Infantry, watched helpless from the Confederate trenches on May 15, 1864 as his home was destroyed by the Union occupants. It had been intended as a sanctuary from the ravages of war. Their story, and those of countless others, is my inspiration.